Okay this is super cool. 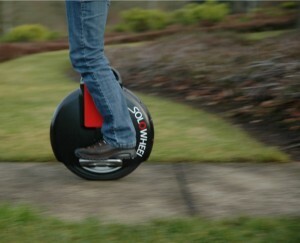 A new kind of segway was introduced at CES this year called a Solowheel which is not a Segway product, by the way. Unlike the Segway, the Solowheel only has a single wheel — and nothing to hold onto. Just like the Segway, Solowheel’s gyroscopic sensors allow for turning, acceleration and deceleration, moving forwards and backwards. Just like a hybrid car, it recaptures energy when slowing down or going downhill. On a full charge, Solowheel’s custom 39V lithium iron phosphate (LiFePO4) battery and 1kW motor can take you 15 to 20 miles at up to 10 MPH. Two big differences between the vehicles are price and size. A new Solowheel costs about a fourth to a third as much as a new Segway and can be some serious competition to Segway. It is also compact enough to fit in a smaller room than a segway. Riding the Solowheel does take practise.The most difficult part is getting on. First timers tend to anchor one ankle against the center pad, hold onto a wall, turn on the device while anchoring the second ankle, then quickly stand up. The more advanced version starts with one leg anchored, gives a skateboard-like pump to get going and anchors the second leg on the roll. Units with training wheels are also available to learn this better! Previous Zappos Falls Victim to Cyber Attack! Next iRobot Introduces Mobile iPad Bot!